Adidas Ice Dive is addressed to active men who prefer to always stay in shape. Adidas Ice Dive Cologne for Men by Adidas 100ml. Eau De Toilette is ice-refrigerant men's fragrance. The perfume will appeal to all active and brave men who like sports and want to fully enjoy your every day. Ice Dive perfume will surprise you with its modernity! Unique mix of fresh fruit tones gently mixed with spicy chords together, and thus form an unmistakable and appealing flavor.Top notes of fragrance Adidas Ice Dive consist of fresh star anise, bergamot, juicy grapefruit, kiwi, mandarin and mint leaves. Intoxicating lavender is combined perfectly with rare yuzu. The heart hides exotic patchouli, geranium blossom and sandalwood. Breathtaking final shade completes animal amber, tonka bean, pepper, intense, pure sensual musk and sweet vanilla. This unique men's fragrance Adidas not only great when you use your sports activities, but also for wearing during the working day. 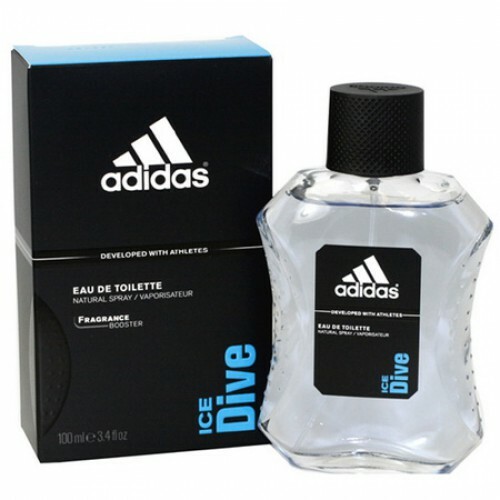 Men's fragrance Adidas Ice Dive will take you a feeling of luxury and elegance throughout the day! This delicious eau de toilette, which is a refreshing boost of energy, contributing to the achievement of life and sports victories. So fresh, energetic fragrance is addressed to an active men who prefer to stay in shape, which are vital to positive emotions and good mood. It is chosen by travelers and adventurers who prefer not to sit still, and conquer new heights and achieve their goals. Enjoy fragrance composition differs bright beginning of citrus notes of mandarin and grapefruit that harmonious supplemented Bergamot undertones, aniseed, lavender, mint. Heart notes are expressed invigorating mix of chords geranium, patchouli, sandalwood. The "base" adequately represented woody and musky notes of vanilla, tonka bean and amber. With toilet water Adidas Ice Dive is always a place of adventure and risk, any adventure on the shoulder, all the difficulties seem small stones on the road, which can easily jump. Discover the fresh and enthusiastic smell!